Professor Christopher Byrne is Professor of Endocrinology and Metabolism within Medicine at the University of Southampton. 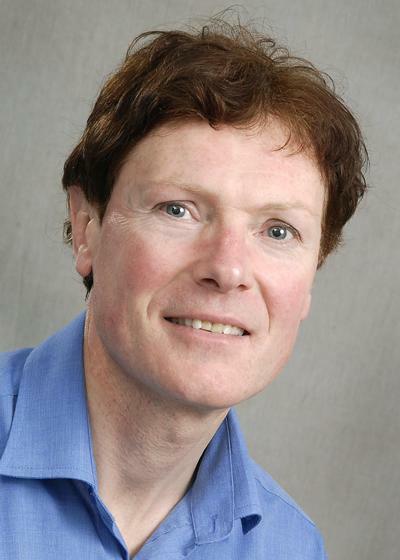 Christopher Byrne was appointed to the Chair of Endocrinology & Metabolism at the University of Southampton in 1999. He trained at Cardiff, Hammersmith Hospital, Cambridge and Stanford Universities. As an MRC clinical training fellow he undertook his PhD in Cambridge (Downing College 1989-1992). He then undertook a 2 year travelling fellowship at Stanford University, CA and was then an MRC fellow at Cambridge University from 1994-1999. He was inaugural Director of the Wellcome Trust Clinical Research Facility at Southampton and is now Principal Investigator within the NIHR Southampton Biomedical Research Centre. He has published over 300 peer reviewed papers and three books related to metabolic syndrome and non alcoholic fatty liver disease (NAFLD). He is also Consultant Metabolic physician at University Hospital Southampton, where working with colleagues in Hepatology he provides a service for patients with diabetes and non alcoholic fatty liver disease (NAFLD). Additionally he specialises in the medical management of morbid obesity and also dyslipidaemias. He was instrumental in establishing the genetic testing service for Familial hypercholesterolaemia (FH) with colleagues at University Hospital Southampton and this NHS service was the first of its kind in England. The Southampton-based service is currently available for over 2 million people on the South Coast. In 2012, he was recipient of the Dorothy Hodgkin prize awarded by Diabetes UK for his research related in diabetes and NAFLD. He is a member of the European Association for the Study of Diabetes NAFLD study Group, Diabetes UK, the European Association for the Study of Diabetes, and is past President of the Royal Society of Medicine, Lipids, Metabolism and Cardiovascular Risk Section. Director Wellcome Trust Clinical Research Facility, Southampton University Hospitals Trust, 4/1999 to 10/2003. Professor Byrne’s research career began in 1989 supported by an MRC Clinical Training Fellowship at Cambridge University. Supervised by the late Professor Nick Hales, his PhD studying liver lipid metabolism was awarded in 1992. In 1992 he was awarded a Visiting Fellowship to study as a post-doctoral scientist at Stanford University School of Medicine, California, studying the apolipoprotein(a)/plasminogen gene cluster and mapping the gene cluster on chromosome 6. During that time he identified and characterised two novel apolipoprotein(a)-related genes. In 1994 he returned to Cambridge supported by an MRC Fellowship to study molecular mechanisms involved in the aetiology of cardio-metabolic risk factors. He completed clinical training and was appointed Consultant in Metabolic medicine at Addenbrooke’s hospital in 1996. In 1999, Professor Byrne and his research team moved to the University of Southampton. The research team’s current programme is focussed on the aetiology, pathogenesis, extra-hepatic complications, and testing novel treatments for non alcoholic fatty liver disease. Wessex Evaluation of fatty Liver and Cardiovascular markers in NAFLD (non alcoholic fatty liver disease) with OMacor thErapy: WELCOME Study completed 2019. The WELCOME (Wessex Evaluation of fatty Liver and Cardiovascular markers in NAFLD [non alcoholic fatty liver disease] with OMacor thErapy) study was a phase IV trial that was undertaken in 100 patients with non alcoholic fatty liver disease (NAFLD). The WELCOME study tested the effects of high dose purified n-3 long chain fatty acids (Omacor- Solvay/Abbott/Pronova 4 grames o.d. on a range of liver and cardio-metabolic outcomes. The WELCOME study was run within the Southampton NIHR Biomedical Research Centre in Nutrition, Lifestyle and Obesity. The trial enabled collaborations with another UK BRU, three other UK universities and with industry (Solvay and Pronova). The trial had core funding from NIHR and also attracted extra grant support from Diabetes UK, the NHS and the University of Pavia (Italy). The WELCOME study was registered with the Diabetes and Hepatology networks. The trial was also adopted by the NIHR Portfolio. The objective of this study is to determine the effects of altering gut microbiota in patients with NAFLD through administration of a combination of a pre and a probiotic (termed a synbiotic) on liver fat and a range of disease biomarkers. Our specific hypothesis is that: synbiotic treatment is beneficial in decreasing liver fat content and synbiotic treatment favourably changes the gut microbiota composition. Our specific aims are: to test the effects of the synbiotic intervention on the primary outcomes (changes in: liver fat percentage and gut microbiota composition) and secondary outcomes (changes in: liver mitochondrial function, gut permeability, gut hormone profile, serum lipopolysaccharide levels, plasma/faecal short chain fatty acids levels, plasma/urine/faecal bile acid and plasma/urine trimethyl-amine (TMA) concentrations). Our study will elucidate whether treatment with a synbiotic can modify gut microbiota and decrease liver fat. Additionally, we will test whether synbiotic treatment can modify metaorganismal pathways and improve metabolic and cardiovascular risk factors associated with NAFLD. Committee member of the British Hyperlipidaemia Association (1997-2000). Mantovani, A., Bonapace, S., Lunardi, G., Salgarello, M., Dugo, C., Gori, S., ... Targher, G. (2018). Association of plasma ceramides with myocardial perfusion in patients with coronary artery disease undergoing stress myocardial perfusion scintigraphy. Arteriosclerosis, Thrombosis, and Vascular Biology, 38(12), 2854-2861. Byrne, C., Patel, J., Scorletti, E., & Targher , G. (2018). Tests for diagnosing and monitoring non-alcoholic fatty liver disease in adults. BMJ, 362(k2734). Wainwright, P., Oluwatowoju, I., Ryan, A., Abu, E., & Byrne, C. D. (2016). Glycaemic control and lipid concentrations in a cohort of people with diabetes over 7 years of follow up: a regional audit of diabetes care in the UK. Diabetic Medicine, 33(3), 386-390. Targher, G., Marchesini, G., & Byrne, C. (2016). Risk of Type 2 diabetes in patients with non-alcoholic fatty liver disease: causal association or epiphenomenon. Diabetes & Metabolism, 42(3), 142-156. Targher, G., & Byrne, C. D. (2015). Circulating markers of liver function and cardiovascular disease risk. Arteriosclerosis, Thrombosis, and Vascular Biology, 2290-2296. Targher, G., & Byrne, C. D. (2015). Gallstone disease and increased risk of ischemic heart disease: causal association or epiphenomenon? Arteriosclerosis, Thrombosis, and Vascular Biology, 35(10), 2073-2075. Ryan, A., & Byrne, C. D. (2015). Importance of early recognition of heterozygous familial hypercholesterolaemia. Current Opinion in Lipidology, 26(4), 298-303. Sung, K. C., Rhee, E. J., Ryu, S., Kim, B. J., Kim, B. S., Lee, W. Y., ... Park, S. W. (2015). Increased cardiovascular mortality in subjects with metabolic syndrome is largely attributable to diabetes and hypertension in 159,971 Korean adults. Journal of Clinical Endocrinology & Metabolism, 100(7), 2606-2612. Targher, G., & Byrne, C. D. (2013). Diagnosis and management of non-alcoholic fatty liver disease and its hemostatic/thrombotic and vascular complications. Seminars in Thrombosis and Hemostasis, 39(2), 214-228. Scorletti, E., & Byrne, C. D. (2013). Omega-3 fatty acids, hepatic lipid metabolism and non-alcoholic fatty liver disease. Annual Review of Nutrition, 33, 231-248. Wild, S. H., & Byrne, C. D. (2013). Towards a personalised diagnosis of type 2 diabetes. The Lancet Diabetes & Endocrinology, 1(1), 6-7. Sung, K. C., Wild, S. H., Kwag, H. J., & Byrne, C. D. (2012). Fatty liver, insulin resistance and features of metabolic syndrome: relationships with coronary artery calcium in 10153 people. Diabetes Care, 35(11), 2359-2364. Sung, K. C., Kang, S-M., Cho, E-J., Park, J. B., Wild, S. H., & Byrne, C. D. (2012). Ferritin is independently associated with the presence of coronary artery calcium in 12033 men. Arteriosclerosis, Thrombosis, and Vascular Biology, 32(10), 2525-2530. Valletta, J. J., Chipperfield, A. J., Clough, G. F., & Byrne, C. D. (2012). Metabolic regulation during constant moderate physical exertion in extreme conditions in Type 1 diabetes. Diabetic Medicine, 29(6), 822-826. Bhatia, L. S., Curzen, N., Calder, P. C., & Byrne, C. D. (2012). Non-alcoholic fatty liver disease: a new and important cardiovascular risk factor. European Heart Journal, 33(10), 1190-200. Wild, S. H., & Byrne, C. D. (2012). Statin use in postmenopausal women is associated with an increased risk of incident diabetes mellitus. Evidence-Based Medicine, 17(6), 192-193. Bruce, K. D., Sihota, K., Byrne, C. D., & Cagampang, F. (2012). The housekeeping gene YWHAZ remains stable in a model of developmentally primed non alcoholic fatty liver disease. Liver International, 32(8), 1315-1321. Byrne, C. D., & Wild, S. H. (2011). Increased risk of glucose intolerance and type 2 diabetes with statins. British Medical Journal, 343. Ahmed, M. H., & Byrne, C. D. (2010). Obstructive sleep apnea syndrome and fatty liver: association or causal link? World Journal of Gastroenterology, 16(34), 4243-4252. Clough, G. F., L'Esperance, V., Turzyniecka, M., Krentz, A., & Byrne, C. D. (2008). Decreased microvascular funtional vasodilatory reserve and features of the metabolic syndrome. FASEB Journal, 22. Byrne, C. D., & Wild, S. H. (2008). Review: thiazolidinediones increase risk of heart failure in type 2 diabetes. ACP Journal Club, 148(1), 5. Turzyniecka, M. J., Ung, J. C. C., Krentz, A. J., Clough, G. F., & Byrne, C. D. (2007). Insulin vascular action in skeletal muscle is attenuated with insulin resistance and features of metabolic syndrome. Diabetologia, 50(Supplement 1), S291. Krentz, A. J., Clough, G., & Byrne, C. D. (2007). Interactions between microvascular and macrovascular disease in diabetes: pathophysiology and therapeutic implications. Diabetes, Obesity and Metabolism, 9(6), 781-791. Ahmed, M., & Byrne, C. (2007). Treating non-alcoholic fatty liver disease. Practice Nursing, 18(3), 120-126. Wild, S. H., & Byrne, C. D. (2006). Metabolic syndrome as a risk indicator. MIMS Cardiovascular, 1(1), 18-21. Byrne, C. D. (2005). Review: fluoxetine, orlistat, and sibutramine modestly reduce weight in type 2 diabetes. ACP Journal Club, 142(1), 18-18. Byrne, C. D., & Wild, SH. (2005). Review: orlistat and sibutramine are modestly effective for weight loss at 1 year. ACP Journal Club, 142(1), 19-19. Poole, R., & Byrne, C. D. (2005). The metabolic syndrome and type 2 diabetes. Minerva Endocrinologica, 30(3), 139-159. Wild, S. H., & Byrne, C. D. (2005). Treatment of lipids to reduce cardiovascular risk among people with the metabolic syndrome or type 2 diabetes. British Journal of Diabetes and Vascular Disease, 5(6), 315-319. Neal, D. A. J., Brown, M. J., Wilkinson, I. B., Byrne, C. D., & Alexander, G. J. M. (2004). Hemodynamic effects of amlodipine, bisoprolol, and lisinopril in hypertensive patients after liver transplantation 1. Transplantation, 77(5), 748-750. Neal, D. A. J., Tom, B. D. M., Luan, J., Wareham, N. J., Gimson, A. E. S., Delriviere, L. D., ... Alexander, G. J. M. (2004). Is there disparity between risk and incidence of cardiovascular disease after liver transplant? Transplantation, 77(1), 93-99. Byrne, C. D., Holt, H. B., Phillips, D. I. W., Wood, P. J., Zhang, J., & Darekar, A. A. (2004). Which features of the metabolic syndrome predict fatty liver in obese men? Diabetologia, 47, p.A224. Feher, M. D., Langley-Hawthorne, C. E., & Byrne, C. D. (2003). Cost-outcome benefits of fibrate therapy in type 2 diabetes. British Journal of Diabetes and Vascular Disease, 3(2), 124-130. Holt, R. I. G., & Byrne, C. D. (2003). The clinical implications of the Heart Protection Study. Cardiovascular Risk Abstracts, 1, 5-7. Maison, P., Byrne, C. D., Hales, C. N., Day, N. E., & Wareham, N. J. (2001). Do different dimensions of the metabolic syndrome change together over time?. Evidence supporting obesity as the central feature. Diabetes Care, 24(10), 1758-1763. Lewis, R. M., James, L. A., Zhang, J., Byrne, C. D., & Hales, C. N. (2001). Effects of maternal iron restriction in the rat on hypoxia-induced gene expression and fetal metabolite levels. British Journal of Nutrition, 85(2), 193-201. Wild, S. H., & Byrne, C. D. (2001). Prevention of type 2 diabetes and associated cardiovascular disease. Cardiabetes, 1, 20-25. Byrne, C. D. (2001). Programming other hormones that affect insulin. British Medical Bulletin, 60(1), 153-171. Wild, S. H., & Byrne, C. D. (2001). The benefits of a Mediterranean diet, statins, aspirin and unsaturated fats. Thrombus, 5(2), 9-11. Byrne, C. D., & Wild, S. H. (Eds.) (2011). The metabolic syndrome: science and clinical practice. Chichester, GB: Wiley-Blackwell. Byrne, C. D., & Wild, S. H. (Eds.) (2007). The metabolic syndrome and primary care. Chichester, UK: John Wiley. Byrne, C. D., & Wild, S. (Eds.) (2005). The metabolic syndrome. Chichester, GB: Wiley. Wild, S. H., & Byrne, C. D. (2011). The epidemiology of the metabolic syndrome and its association with diabetes, cardiovascular disease and other conditions. In The Metabolic Syndrome (pp. 1-18). Chichester, GB: Wiley-Blackwell. Ahmed, M. H., Olufadi, R., & Byrne, C. D. (2010). Metabolic syndrome, diabetes and cardiovascular risk. In P. P. Toth (Ed. ), The Year in Lipid Disorders (pp. 24-45). Oxford, GB: Clinical Publishing. Byrne, C. D., & Phillips, D. I. W. (2006). The developmental environment and its role in the metabolic syndrome. In P. Gluckman, & M. Hanson (Eds. ), Developmental Origins of Health and Disease (pp. 265-274). Cambridge, UK: Cambridge University Press. Ahmed, M. H., & Byrne, C. D. (2005). Non-alcoholic steatohepatitis. In C. D. Byrne, & S. Wild (Eds. ), The Metabolic Syndrome (pp. 279-305). Chichester, GB: Wiley. Wild, S. H., & Byrne, C. D. (2005). The global burden of the metabolic syndrome and its consequences for diabetes and cardiovascular disease. In C. D. Byrne, & S. H. Wild (Eds. ), The Metabolic Syndrome (pp. 1-43). John Wiley & Sons, Ltd..
Krentz, A. J., Olufadi, R., & Byrne, C. D. (2004). Point-of-care testing in diabetes mellitus. In Point-of-Care Testing (pp. 309-323). Washington, US: AACC Press. Byrne, C. D. (2001). Reducing risk of atherosclerotic vascular disease in the diabetic population. In P. Weissberg (Ed. ), Horizons in Medicine (pp. 39-55). Royal College of Physicians. Valletta, J. J., Chipperfield, A. J., & Byrne, C. D. (2009). Gaussian process modelling of blood glucose response to free-living physical activity data in people with type 1 diabetes. In Proceedings of the 31st Annual International Conference of the IEEE Engineering in Medicine and Biology Society (pp. 4913-4916). New York, USA: Institute of Electrical and Electronics Engineers. Bruce, K. D., Byrne, C. D., & Friedland, J. S. (2009). Metabolic syndrome. In Horizons in Medicine 21: The Proceedings of the Advanced Medicine Conference 2009 (pp. 39-46). (Horizons in Medicine; Vol. 21). London, GB: Royal College of Physicans. Byrne, C. D., Turzyniecka, M., Wild, S. H., Krentz, A. J., Chipperfield, A. J., Gamble, J., & Clough, G. F. (2009). Skeletal muscle microvascular exchange capacity is associated with hyperglycaemia in non-diabetic subjects with central obesity. Paper presented at 45th Annual Meeting of the European Assocation for the Study of Diabetes, . Walter, L., Turzyniecka, M., Byrne, C. D., Gamble, J., & Clough, G. F. (2007). Muscle microvascular filtration capacity and blood flow in metabolic syndrome. Microcirculation, 14(6), p.645. Ung, J. C. C., Turzyniecka, M., & Clough, G. F. (2007). Relationship between muscle blood flow and insulin sensitivity in metabolica syndrome. Microcirculation, 14(6), p.658. Professor Byrne gives regular lectures to physicians and students on diabetes, non alcoholic fatty liver disease, the metabolic syndrome, and the diagnosis and management of hyperlipidaemias.